The collapse of Eastern European and Soviet socialism in the early 1990s caused the most severe economic crisis in Cuba’s revolutionary history. The economic crisis of the 1990s forced the Cuban government to implement a series of policy measures to transform some aspects of the Cuban economy, while retaining (most of) the socialist character of the Cuban revolution. The legalization of the U.S. dollar in 1993, the expansion of a nationwide network of hard currency stores, offering a wide range of higher quality consumer products outside the rationing system in 1995, and the creation of a new currency, the Cuban convertible peso (CUC), and a national network of State-operated foreign exchange houses (Casas de Cambio, S.A., CADECA) in the same year marked the beginning of Cuba’s efforts to attract remittances from abroad during the so-called Special Period. These measures were complemented with the transformation of the banking system and the expansion of money transfer company Western Union offices in select (hard currency) retail outlets throughout the island in 1997. As a result of these measures, increased Cuban emigration abroad, and improvements in telecommunications and telephone services, the linkages between Cubans living overseas and their friends and relatives in the island expanded significantly. This phenomenon was accentuated by the impressive growth in the influx of cash and in-kind remittances or transfers from abroad, and more frequent visits by Cuban émigrés to the island. In the case of Cuba, remittances have altered social interactions, transformed cultural values, and indirectly contributed to one of the most puzzling contradictions of contemporary Cuban society: palpable increases in income inequality in a supposedly socialist and egalitarian society. The growing influx and importance of remittances in the Cuban economy have also sparked a growing interest in the study of this relatively new transnational phenomenon. The Association for the Study of the Cuban Economy (ASCE) has been one of the leading forums in which scholars and experts on remittances to Cuba have been able to disseminate and share the results of their research and findings about this relatively new manifestation of the growing linkages between global flows of people (migration) and unilateral transfers of private capital (remittances) and their magnitude and impact on Cuba’s economy and society. Given the structural characteristics of the Cuban economy, remittances are likely to continue to play a key role, regardless of the type of “transition” that takes place in the future. As Cuba moves away from “classical socialism,” and remittances gain more importance in its economy and society, ASCE has the potential of making meaningful and relevant contributions to the study of this transnational socioeconomic phenomenon. This paper presents a brief overview of ASCE’s contributions to the literature on remittances to Cuba since the organization’s inception in 1991. The first section discusses the rationale for the study of remittances to Cuba, and for exploring ASCE’s important contributions to the growing body of work on this subject. This is followed by a detailed summary of the principal findings of this study, with a particular emphasis on the quantity of articles produced by ASCE members engaged in the study of remittances, and the classification of their works by specifically-defined categories. Finally, the third section three recommends possible areas of study and future contributions that ASCE can make to the study of the complex, but important, topic of remittances to Cuba. There are several reasons for studying and analyzing the influx of remittances to Cuba, and their impact in the Cuban economy, which at least may partially explain why this topic has been gaining importance among ASCE members in recent years. As Table 1 indicates, in terms of magnitude, remittances occupy a very significant place in the Cuban economy. In 2007, remittances accounted for 1.6% of Gross Domestic Product (GDP); while this figure is relatively small, when compared to other remittances-dependent countries in the Western Hemisphere and in other regions of the world, the influx of remittances to Cuba has expanded significantly over the last decade. Remittances to Cuba expanded from an estimated $730 million in 2001 to $951 million in 2008, an increase of 30.3% over this period (González-Corzo & Larson, 2008). Remittances also represent a notable share of Cuba’s two principal sources of foreign exchange receipts: international tourism and merchandise exports. In 2007, remittances represented 42.5% of gross tourism receipts, and 257% of merchandise exports. The share of remittances to merchandise imports in Cuba was also quite significant by global standards. Remittances represented 9.4% of merchandise imports at the end of 2007, which exceeded the same ratio for other remittances- dependent countries in Latin America and the Caribbean. At the macroeconomic level, remittances represent a significant source of foreign exchange receipts, stimulate economic growth, and serve as a stabilizing force on the balance of payments, the foreign exchange market, and the macro economy in receiving countries (Fanjnzylber & López, 2008). At the microeconomic level remittances serve as a supplemental source of household income, often shifting the households’ budget constraint outwards (to the right) and expanding its “consumption possibilities frontier.” Remittances also facilitate investment in human and physical capital by providing additional sources of funding for education, health care, entrepreneurial activities, investments in small and medium enterprises (SMEs), etc. (Puerta, 2008). On the negative side, remittances sometimes result in economic distortions and the emergence of new social problems. Some of the most notable distortions include the so-called “Dutch disease,” the appreciation of the real exchange rate, the loss of domestic competitiveness as a result of the appreciation of the domestic currency, increases in the current account deficit, the weakening of monetary policy tools and controls, inflationary pressures, and distortions in the allocation of foreign and domestic capital (Fanjnzylber & López, 2008). Remittances also reduce the labor force participation rate (LFPR) of some receiving households, and in some cases even encourage “parasitism” by discouraging recipients, particularly those with lower levels of schooling (or educational attainment), from engaging in productive activities (Fanjnzylber & López, 2008). Remittances are also associated with the loss of income (and tax revenue) experienced by “sending countries” as a consequence of the decision to migrate by a significant share of a country’s (productive) population (Fanjnzylber & López, 2008). Finally, remittances are often associated with increases in income inequality and higher levels of socioeconomic stratification (Fanjnzylber & López, 2008; Puerta, 2008). 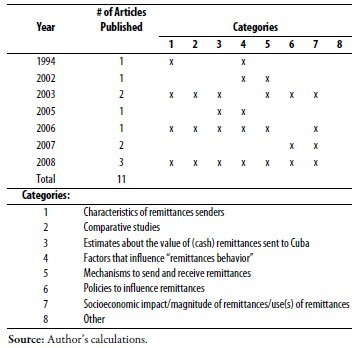 Table 2 presents the articles about remittances to Cuba published in Cuba in Transition between 1991 and 2008. In order to classify all the articles about remittances to Cuba published in Cuba in Transition during this period, I developed eight general categories based on the principal topics covered in the general literature about remittances. 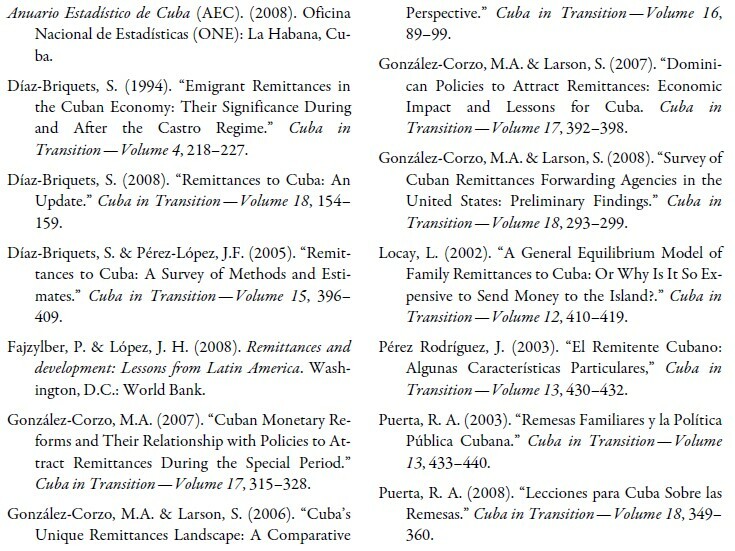 Each article about remittances to Cuba published in Cuba in Transition during the 1991– 2008 was placed in one or more categories, depending on its scope and objectives, in order to determine the principal topics (or categories) covered in the articles that have appeared in Cuba in Transition, discover possible gaps, and identify (and recommend) possible areas for future research and investigation. Based on this methodology, and using the data that appears in Table 2, we can draw several important observations. First, half of all the articles about remittances published in Cuba in Transition between 1991 and 2008 discuss or address the factors that influence remittances behavior in one form or another. With five out of ten articles covering this topic, this is by far the most studied aspect of the study of remittances among the articles published in Cuba in Transition. The second most studied topics are: the characteristics of remitters and senders, estimates about the value of (cash) remittances sent to Cuba, mechanisms to send and receive remittances, and the socioeconomic impact and the magnitude of remittances in the Cuban economy. There are four articles that include each of the topics at varying degrees. The third most studied topics are: comparative studies and policies to influence remittances. In both cases, there are three articles addressing these topics. In terms of individual articles and contributions by ASCE members to the study of remittances to Cuba it is worth noting that while the first volume of Cuba in Transition was published in 1991, the first article about remittances appeared in 1994. In “Emigrant Remittances in the Cuban Economy” (1994), Sergio Díaz-Briquets evaluates the historical determinants of Cuban-American remittances, and uses the demographic characteristics of the Cuban population in the U.S. to estimate their propensity to remit and the amount of annual remittances to Cuba. Eight years later, in 2002, Luis Locay contributed a paper titled, “A General Equilibrium Model of Family Remittances to Cuba.” This was the second article (or paper) about remittances to Cuba published in Cuba in Transition. In this paper, Locay applied a general equilibrium approach to analyze and explain the relatively high costs of sending remittances to Cuba. The third paper about remittances to Cuba, “El Remitente Cubano: Algunas Características Particulares,” was presented by Joaquin Pérez Rodríguez in 2003. This paper summarizes the results of a 2002 survey about Cuban-American remitters in Miami-Dade County, Florida conducted for the Cuba Study Group (CSG) by Bendixen and Associates. Pérez Rodríguez (2003) described the principal socioeconomic characteristics of Cuban remittances senders in Miami, FL, and their views about traveling and sending remittances to Cuba. Another paper by Ricardo Puerta titled, “Remesas Familiares y la Política Pública Cubana,” was presented at the same ASCE meeting and also published in Cuba in Transition in 2003. This paper discusses and compares previous estimates about the amount of (cash) remittances sent to Cuba, compares Cuba with other countries in Latin America and the Caribbean, and explores the magnitude of remittances in the Cuban economy from a comparative perspective. The fifth paper about remittances to Cuba published in Cuba in Transition was written by Sergio Díaz-Briquets and Jorge F. Pérez-López two years later, in 2005. This paper surveys the principal methods that have been used to estimate the value of remittances to Cuba. The authors focused on five specific methods: (1) estimates from balance of payment (BOP) statistics; (2) estimates based on remitter surveys; (3) estimates based on surveys of remittances receivers; (4) ad hoc estimates by subject matter experts and specialists; and (5) estimates based on the propensity to remit of Cuban émigrés (Díaz-Briquets & Pérez-López, 2005). This was the first time that readers of Cuba in Transition were presented with a rigorous and detailed survey of the most commonly-used methods to estimate remittances to Cuba. In 2006, I co-authored a paper with Scott Larson in which we compared “Cuba’s Remittances Landscape” with the remittances market of the Dominican Republic and El Salvador. In this paper we defined each country’s “remittances landscape” (or remittances market) as the senders, receivers and mechanisms to send and receive and regulate remittances. In 2007, I wrote a second paper, which was also published in Cuba in Transition, exploring the relationship between Cuba’s monetary reforms during the Special Period and government policies to attract remittances from abroad, and their impact on remittances, household income, and consumption. Scott Larson and I also co-authored another paper about remittances to Cuba in 2007, which discussed the policy measures implemented by the Dominican Republic to attract remittances from abroad, and the possible lessons and implications for Cuba. As Table 2 indicates, 2008 was the year in which the largest number of articles (3) about remittances to Cuba was published in Cuba in Transition. The first article, “Remittances to Cuba: An Update,” by Sergio Díaz-Briquets, presents the results of the “2007 Cuban Telephone Survey” designed by the author which captured data about remittances receivers by age and race, the frequency of remittances, the principal methods by which they receive remittances, the (“source”) countries from which remittances are sent to Cuba, and the uses of remittances. The second paper, “Lecciones para Cuba Sobre las Remesas,” by Ricardo Puerta, discusses the lessons learned from Honduras’ experiences with remittances, and their possible applications for Cuba. It also provides a brief overview of the ongoing debate among Cuba scholars concerning estimates of the annual amount of (cash) remittances sent to Cuba, and outlines the positive and negative contributions (and effects) of remittances on the societies and economies of receiving countries. The third paper, “Survey of Cuban Remittances Forwarding Agencies in the United States,” was co-authored by me and Scott Larson. Our paper presents the results of a survey of “bricks and mortar” Cuban remittances forwarding agencies (RFs) operating in the U.S. that we conducted between October 2007 and April 2008, and specifically focuses on their distribution by geographic location, the services they offer, the transaction costs associated with these services, and the amount of time it takes them to delivery (cash) remittances to their clients in Cuba. As Table 2 demonstrates, ASCE’s contributions to the literature about remittances to Cuba have been quite significant and well-diversified. The articles (or papers) published in Cuba in Transition during the 1991–2008 period have covered a wide range of topics including: the demographic and socioeconomic characteristics of remittances senders and receivers, comparative studies, estimates about the value of remittances to Cuba, factors that influence remittances behavior, existing mechanisms to send and receive remittances, policies to influence and attract remittances, and the socioeconomic impact and magnitude of remittances. estimates of in-kind transfers to Cuba. Given the strong likelihood that remittances will continue to play a critical role in the Cuban economy in the foreseeable future, those of us interested in the study of remittances to Cuba have a unique opportunity to make valuable contributions to the literature about this increasingly complex socioeconomic phenomenon within ASCE, and, of course, within our respective roles and positions outside the Association. 1. I would like to thank Ricardo Puerta and Jorge F. Pérez-López for their valuable comments and suggestions, and their assistance with the preparation of this manuscript.